animal holding a looped handle. The four feet slope downwards to a curled point. The underneath of the basin has a cast mark reading Baieian (‘Plum Flourish Studio’). The metal is of warm reddish brown tone with a rich patina. The interior is of darker colour and completely plain. With a tomobako. 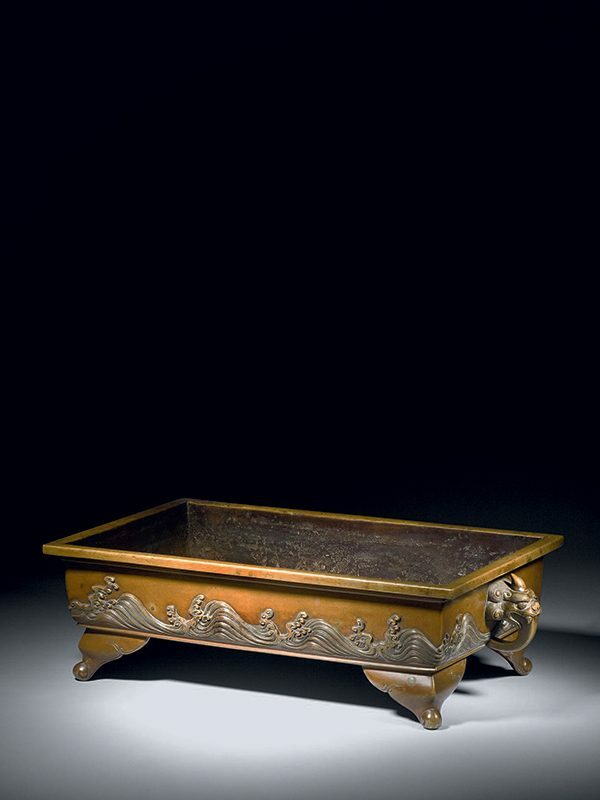 The relief decoration as well as the handles and feet of this elegant bronze basin are clearly inspired by Chinese bronzes, a style of bronze casting that was quite prevalent in Japan at the time. The word Sentoku mentioned on the box refers to the soft yellow bronze appearance which was an alloy used by the Chinese during the Xuande period (1425 ­- 1435). The inscription on the tomobako also mentions the word suna­-hachi (literally meaning ‘sand bowl’). This refers to the intended function of this basin, which is used for indoor miniature dry landscaping and formal flower arrangement.